To get started you need to create a new Audience Network App for use solely in Instant Articles (even if you already use Audience Network elsewhere). This is done through your Instant Articles dashboard on your Facebook Page. Navigate to your Facebook Page -> Settings -> Instant Articles / Configuration. Scroll down to the Audience Network section, check the box and click Getting Started. This will create a new Audience Network App that you can access through the new Your Dashboard link. Once an Audience Network App has been created you can then create a Placement using the Audience Network Interface. Refer to the Audience Network Documentation for a step by step guide. Don't forget to add your payment information to your Audience Network App otherwise ads will stop being served once you reach the threshold. You can read more about signup for Audience Network at the official Facebook Documentation. Copy the Placement ID of the Audience Network ad you created and paste it into the Placement ID input on the Ads tab. Do the same with the Recirculation Ad if you're using that as well. Make sure the rest of the fields match the screenshot above and save the settings. It normally takes a day or so for Facebook to parse your content and start showing ads. We recommend familiarising yourself with Facebook's Ad serving policy. N.b. Any changes made to Ad settings are only applied to new or updated articles. To apply the settings to all your older articles you can use the Mass Post Syncer to update them all. Enable Ads - Enable or disable ads in your articles. Auto Place Ads - Allow Facebook to automatically place ads in your articles. This is recommended in 99% of cases. Ad Density - How often you want ads to appear in your articles. Ad Type - If you're not using Audience Network or wish to use custom ads then change this option to Custom and add in your own ad code. 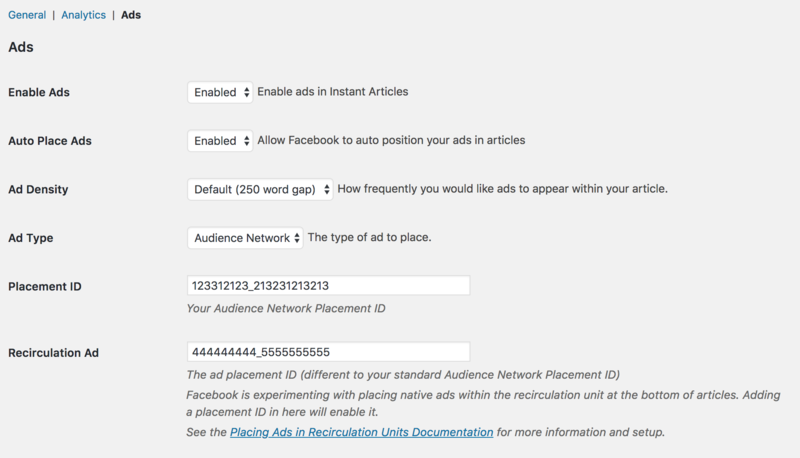 Placement ID - The ID of the Audience Network ad to use for the ads inside your article. You should copy and paste this from your Ad dashboard. Recirculation Ad -The ID of the Audience Network ad to use for your Recirculation ad in the Footer. This has to be different from the Placement ID used above.